Did you ever wonder why grains received top billing in the USADA’s Food Guide Pyramid? Purely and simply, grains are great foods. Grains are also the world’s most plentiful food and enjoy first place in the diet of nearly every culture, except perhaps in the fish-loving Eskimos. The wheat bran is the outer layer of the kernel that covers the grain inside. It is removed when wheat is refined into white flour. Bran is the part of the wheat kernel that is highest in fiber, primarily the insoluble type, which has been shown to lower the risk of colon cancer. Bran is also the part of the wheat plant that contains most of the minerals and vitamins. The wheat germ, even though it is the smallest part of the grain kernel, is the most nutrient dense, meaning it contains more nutrients per weight than any other part of the kernel. The germ is the seed part of the kernel, which sprouts other kernels if planted. So, when a grain is called “sprouted” (or “germinated”) it means the germ part of the kernel has reproduced itself, adding more nutrients to the kernel. The germ also contains what little fats are in the kernel, which is one reason that food factories like to remove this pesty, but nutritious, part of the grain: to keep form turning rancid and shortening the shelf life of the loaf of bread. Wheat germ is often used as a dietary supplement because it is rich in iron, B vitamins, vitamin E, and the antioxidant selenium. The endosperm is the largest part of the kernel, and it is the least nutrient dense of the three parts, meaning it contains the least nutrients per volume of weight. Yet, because it makes up around 80 percent of the kernel, it contains the most proteins and carbohydrates. There are many types of grains including wheat, oats, barley, buckwheat, amaranth, quinoa, millet, rice and rye. Some people may not be able to consume grains, but for those that are able, including whole grains into a balanced diet is essential. It is likely you’ve seen the plethora of varieties in the bread aisle. Cracked wheat starts as the whole kernels of hard varieties of wheat. The kernels are then cracked into small pieces, which add a crunchy texture when added to bread or cereal. Or, you can cook cracked wheat in water like rice. Bulgur wheat is a form of cracked wheat. The whole wheat kernels are cooked, dried, and cracked into a coarse grain that is usually used in cooked cereal, pilaf, or a popular Middle Easter grain dish, tabbouleh. Wheatgrass (sprouts) results when the wheat kernel has been allowed to grow, or germinate. Whether or not sprouted wheat is more nutritious than an unsprouted wheat is uncertain. During the sprouting process, much of the fat and carbohydrates in the seed is used for growth. The sprout still contains a lot of protein and, possibly, an increased amount of vitamins and minerals. The nutritional benefits depend upon eating a large volume of the sprouts, since they are now mostly water rather than protein by weight. Stone-ground whole wheat is ground the old-fashioned way – between rotating stones, so that the bran, germ, and endosperm remain together. Wheat purists believe that stone grinding produces a more nutritious flour than the conventional high-speed roller milling, which, they claim, may overheat the grain and cause deterioration of some nutrients. Stone-ground flour usually needs to be refrigerated once opened, since the oil released during grinding makes it spoil more quickly. It’s best to store any kind of whole-grain flour in refrigerator if you won’t be using it up within a month or two. Depending on the heat produced during milling, nutritionally, stone-ground and roller-milled flour should be about the same. As a general guide, the heavier the bread, the more nutrition it contains. When shopping, compare breads by holding a loaf in each hand. The loaf that weighs more is more loaded with nutrients. Bread made with whole wheat flour is naturally heavier, firmer, and more nutrient dense than airy white bread. Brown bread is not always more nutritious than white! In fact, the brown color is often just a marketing gimmick, and the bread is just white bread with coloring added. To tell if a brown bread really is more nutritious, read the label. If the first ingredient is “whole wheat,” this is a healthy food. If it says “bleached” or “enriched” flour or “wheat flour,” it is just colored white bread. 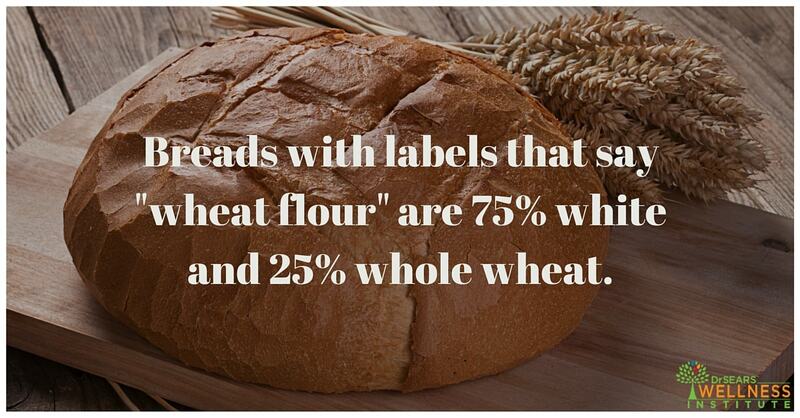 Breads with labels that say “wheat flour” are 75 percent white and 25 percent whole wheat. Always check the label rather than the color.